ASE EUROPE is your first supplier for mostly all the existing ceiling tiles and suspension systems. For each project, each application we can help you to find out which system will be the most convenient, according to the technical requirements, (and your budget). 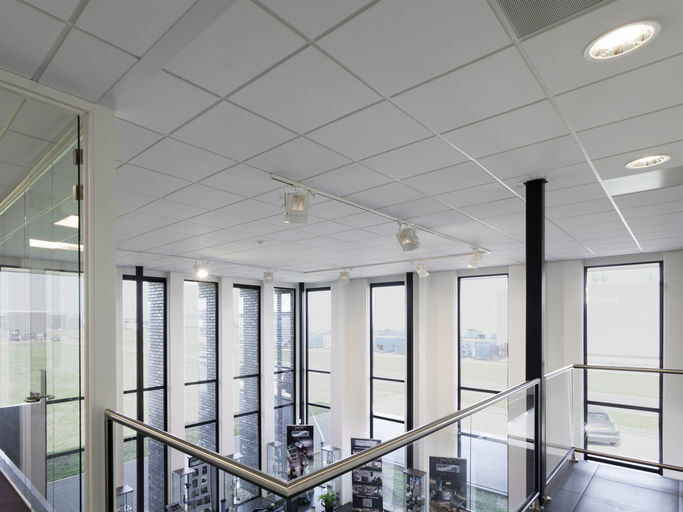 In one office block, we can for example combine gypsum laminated ceiling tiles in the kitchen, acoustic mineral fibre ceiling tiles in office rooms, high absorbing acoustic mineral fibre ceiling tiles in the conference room and metal ceiling tiles in the washroom. Put the right ceiling at the right place. Suspended ceiling systems are particularly suitable for applications in offices, hotels, commercial and public areas, where a resistant, long-lasting surface and easy maintenance are key criteria. Perforated panels combined with insulating materials are extremely sound-absorbent, which guarantees an excellent acoustic effect. Our mineral fibre ceiling tiles are made from new generation bio-soluble mineral wool, clay and starch and are therefore based on natural raw materials. Mineral wool offers excellent fire resistance (30-120 minutes) and acoustic performance. The tiles are available in various designs (Fresko, Feinfresko, Star, Mercure, Feinstratos, Schlicht, Ranura), thicknesses and sizes. We offer standard gypsum boards, fire resistance gypsum boards, and waterproof gypsum boards, in various thicknesses and sizes. Gypsum boards are panel products, that consist of a non-combustible core, made mostly out of gypsum. The gypsum boards can easily be installed with a wide range of suspension systems, using only a limited number of tools. Panels can be cut easily with a knife or saw, and later attached with a variety of fasteners (screws, nails, staples). Gypsum boards can actively help to control sound transmission. All this makes gypsum boards a durable, economic and versatile building material as a ceiling solution. The front side of the tile is covered with a PVC film, available in different designs. At the back side, the panel is protected with an aluminium foil, mainly protecting against humidity. The aluminium film provides extra protection to the panel, and the PVC film gives a nice design. Due to the protective aluminium film, the tiles are water resistant and suitable to use in areas like showers, bathrooms, and kitchens. On top of that, the tiles are fire resistant, non-combustible, 100% asbestos free, anti-static, demountable, and easy to clean with no more than a damp sponge or cloth. 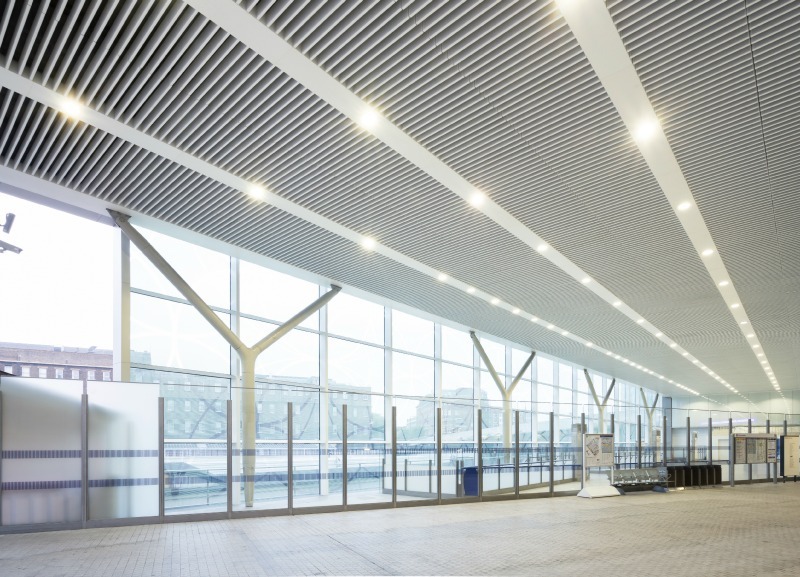 Metal ceilings have been an important part of the modular ceiling world. Characteristics such as durability, high stability, resistance to odours, functional aesthetics, ease of cleaning, and various design options created a continuous high-end image for metal ceilings. Tiles are available in standard colours white and silver. Any other colour is available on request. 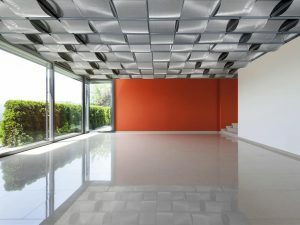 Aluminium ceilings are particularly suitable for application in commercial or public areas, where a resistant, long-lasting surface and easy maintenance are key criteria. 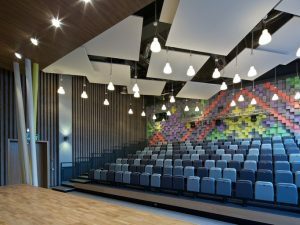 Perforated panels combined with insulating materials are extremely sound-absorbent, which guarantees an excellent acoustic effect, perfect for places with a lot of crowd. Ceiling tiles are mostly installed as lay-in or clip-in. The Lay-in system allows you to see the suspension system, mostly a T-grid structure. Lay-in tiles can be placed upon the T-grid system, where the tiles are at the same level of the suspension system or as drop-down, where tiles drop a couple of millimetres below the suspension system, resulting in an optical treat. The Clip-in system implies that, as the name suggest, the tiles are clipped into the supporting structure, here triangular profiles. This provides a flat surface, without showing the suspension system, and thus providing a very neat appearance. Open cell ceilings are particularly suitable for entrances, large public areas, shopping centres, and airports to create an uninterrupted, uniform overall look. 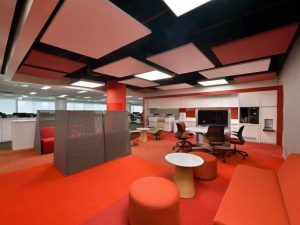 Open cell ceilings are a versatile solution, offered in a wide range of shapes and colours. You can put a diffused lighting system within the ceiling cavity or spotlights positioned within the cells. These features allow designers to create very outstanding effects. Metal ceiling strips offer a wide variety for creative solutions to decorate, renovate, and create partitions, resulting in free disposition of the false ceiling through different sections. It is easy to install, and offers an endless range of shapes, dimensions, and mounting systems, which allow easy access to the covered ceiling space. Our strips are long-lasting and unaffected by dirt. They are very easy to clean, and therefore the perfect solution for big premises such as hospitals, offices, shops, exhibition centres and airports.